This entry was posted in misc. notes and tagged misc. note on August 29, 2010 by Ted Kavadas. Although I don’t agree with this quote, it is interesting for a variety of reasons. It appears to echo the belief of many at this juncture. This entry was posted in Economic Forecasts and tagged "Double-Dip" recession, Stock Market on August 27, 2010 by Ted Kavadas. I have previously written of the topic of state budgets and methods used to “balance” them in the July 21, 2009 post. There is a lot that can be written about the efforts to conceal the true nature of states’ financial conditions. By “sweeping (financial) problems under the rug” instead of truly solving the deficit problems, it almost seems as if states are inherently betting (in a big way) that current economic hardship is transitory, and that better future economic conditions will “save the day.” In effect, there is little need to solve structural budget/financial problems because a strengthening economy will alleviate or eliminate such issues. It is not hard to envision a scenario in which the three aforementioned “crutches” states are employing to “make it through” their financial crises are no longer available. Exceedingly dubious “quick fixes,” placing large (inherent) bets on “sunnier” economic days ahead, and receiving large-scale federal government support are not conditions that can, or should be, relied upon on an ongoing basis. Of course, these “crutches” should never have been viewed as feasible options in the first place. This entry was posted in Uncategorized and tagged Quick Fix, state budget deficits on August 25, 2010 by Ted Kavadas. 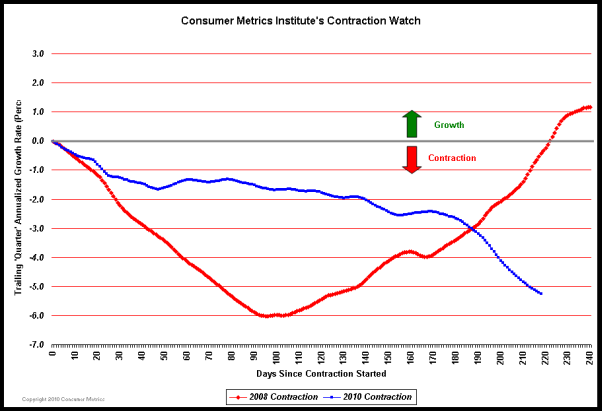 Consumer Metrics Institute Data: Red Alert? 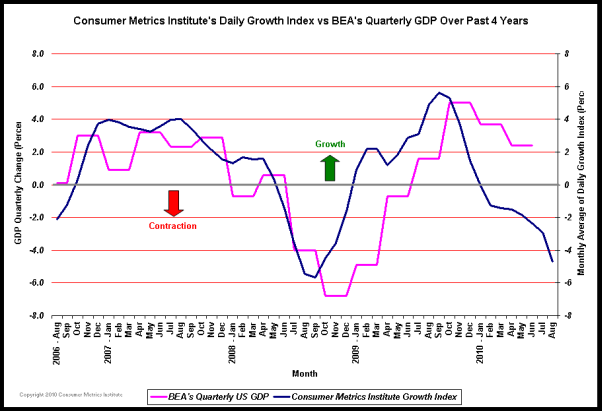 As one can see, the Daily Growth Index is rapidly approaching the low of the 2008 reading; perhaps more importantly there seems to be no signs of abatement in its downward trajectory. Also of great importance is the rift between its reading and that of Quarterly GDP. Here again, the readings are rather draconian, even when compared to the 2008 event. Of course, before one can draw solid conclusions from CMI’s data, one has to have a solid understanding of the methodologies used. This is difficult with CMI’s data as it is proprietary, and as such, it is much akin to other “black box” mechanisms where computations aren’t disclosed. However, from an “all-things-considered” basis, it would appear as if CMI’s readings present the most negative forecasts among popularly published indicators. 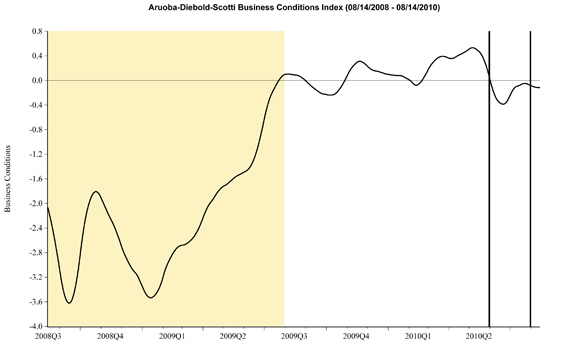 This entry was posted in Economic Forecasts and tagged Consumer Metrics Institute, economic forecasting, economic indicators on August 23, 2010 by Ted Kavadas. 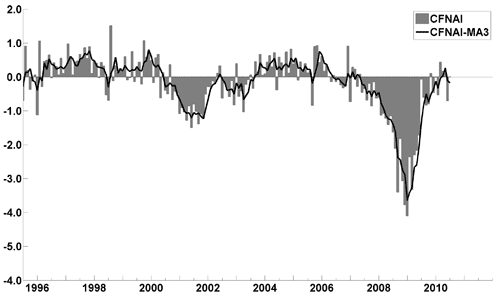 The data was last updated August 3, 2010, reflecting May 2010 levels. Here is a table showing various statistics with regard to National Level participation and costs going back to FY2007. As seen in this table, the number of people participating as of May 2010 is 40,801,392, up 18.6% from year-ago levels. As a reference point, the figure as of May 2007 was 26,409,288. This entry was posted in Uncategorized and tagged food assistance on August 20, 2010 by Ted Kavadas. This is the latest effort from The Federal Reserve which questions whether asset bubbles, in this case the Housing Bubble, can be accurately identified as they form. While one may argue as to whether economic theory can accurately spot asset bubbles, there definitely is a chronic need to do so – as well as to take proper remedial action. As I wrote in an April 8 post, “Our societal inability to spot and prevent asset bubbles is problematical.” We simply can’t afford to go through numerous asset bubble booms and busts. This issue is especially critical now given that there are numerous large asset bubbles currently in existence on a global basis. This entry was posted in Bubbles (Asset), Real Estate and tagged asset bubbles, bubbles, real estate bubble on August 19, 2010 by Ted Kavadas. The story provides an overview of the strong market environment for both corporate and junk bonds. My view is that the entire corporate bond market is in a bubble. This bubble is related to the bubble in U.S. Treasuries which I have previously commented upon. This entry was posted in Bubbles (Asset), Investor and tagged asset bubbles, bond bubble, bubbles on August 18, 2010 by Ted Kavadas. This entry was posted in Investor, Stock Market and tagged S&P500, Stock Market on August 16, 2010 by Ted Kavadas. I found a few items of interest in the August Wall Street Journal Economic Forecast Survey. As compared to last month’s survey, there were some material changes. I post various economic forecasts because I believe they should be carefully monitored. However, as those familiar with this blog are aware, I do not agree with the many of the consensus estimates and much of the commentary in these forecast surveys. This entry was posted in Economic Forecasts and tagged Economic Forecasts on August 15, 2010 by Ted Kavadas.